Due to space we will NOT be able to fit complete lists of medication on your card... please ONLY include the most important ones here and provide a complete list in the large box below. Not about medications: Due to space we will NOT be able to fit complete lists of medication on your card... please ONLY include the most important ones here and provide a complete list in the large box below. 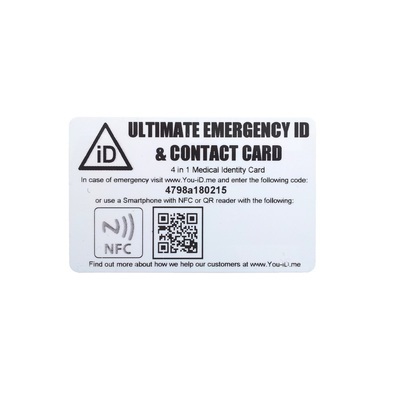 This information will not be visible on the card but can be retrieved by emergency services when they 'touch' your card with a compatible Smartphone. List as much information as you wish them to be aware of. There are no limits. The more the better. Please check to indicate you agree to our terms and conditions. 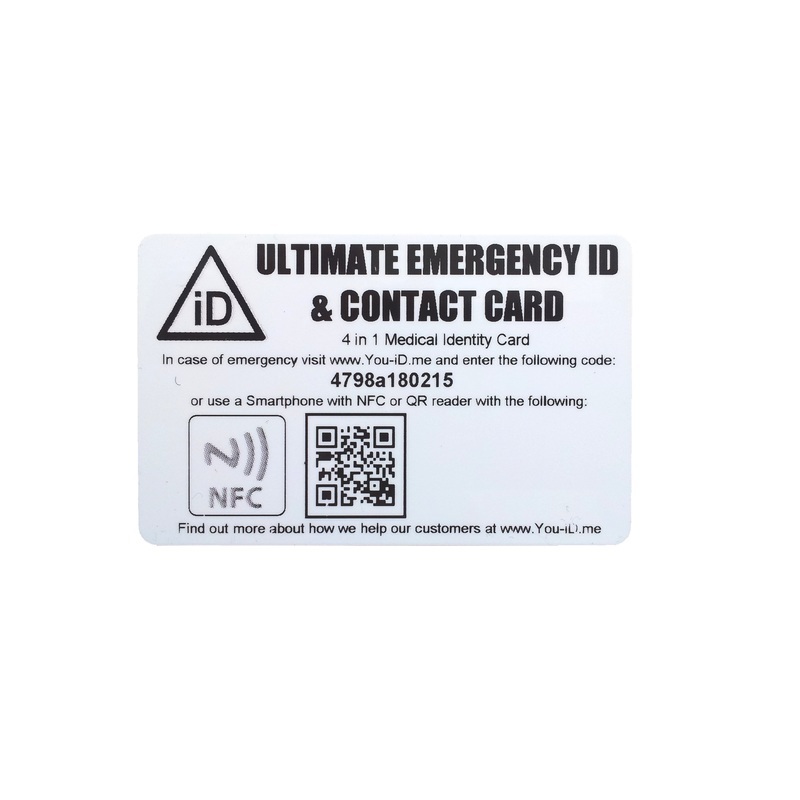 Our latest wallet identity card is the ultimate effective ID tool to carry in your purse or wallet; that's why we called it THE ULTIMATE EMERGENCY ID CARD. IT'S THE ID CARD THAT 'TALKS' TO EMERGENCY SERVICES..! This means that in the event of an emergency, paramedics can access the information that you have chosen to share in your emergency ID profile . 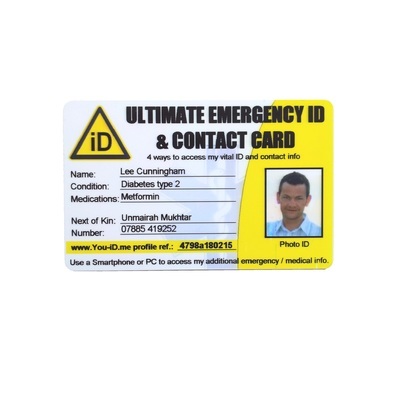 The ULTIMATE ID CARD usually means buying an annual subscription for us to hold all your Emergency ID Profile Information, but for a limited time you can get a years subscription for FREE. 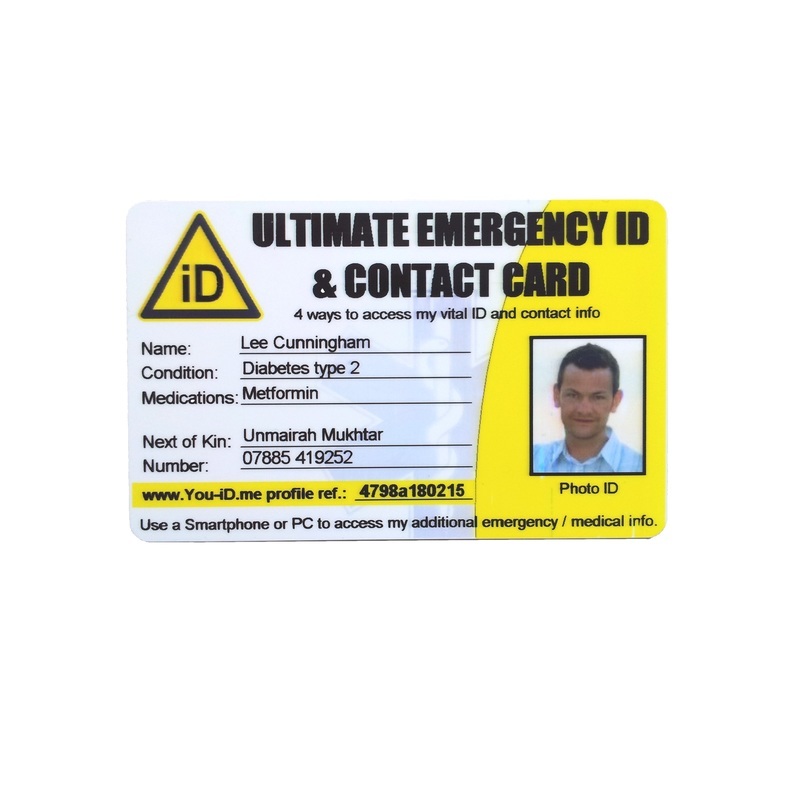 Order today and pay just £29.99 and get your fully personalised card with 12 month hosting of your Emergency ID Profile totally free. You can even change your information up to 6 times without charge.